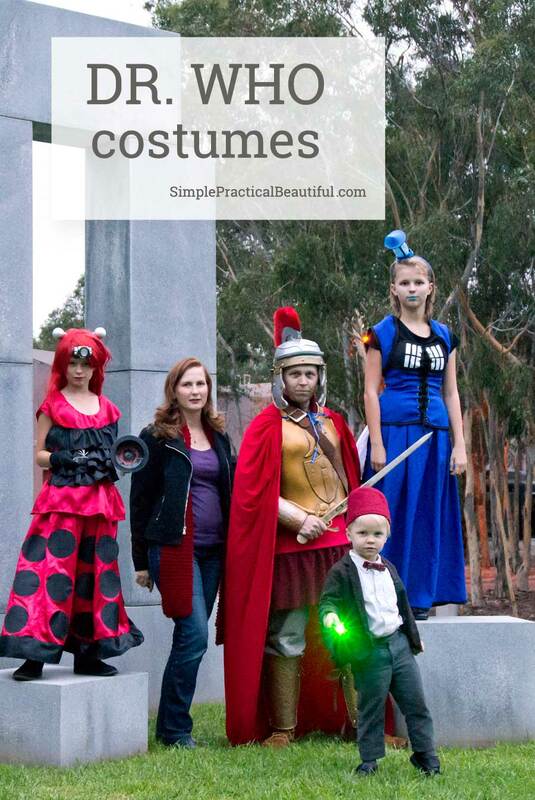 Cosplay as Doctor Who this Halloween with costumes for the 11th Doctor, Amy Pond, the Last Centurion, a Dalek, and the Tardis. We are a family of geeks. I was raised on black and white sci-fi movies and my husband loves all things fantasy. I’m proud that our children are following in our geeky footsteps. So, of course, we love Doctor Who. While it would be difficult to pick my favorite Doctor, Matt Smith was wonderful as the 11th Doctor. And his companions, Amy and Rory, were awesome. 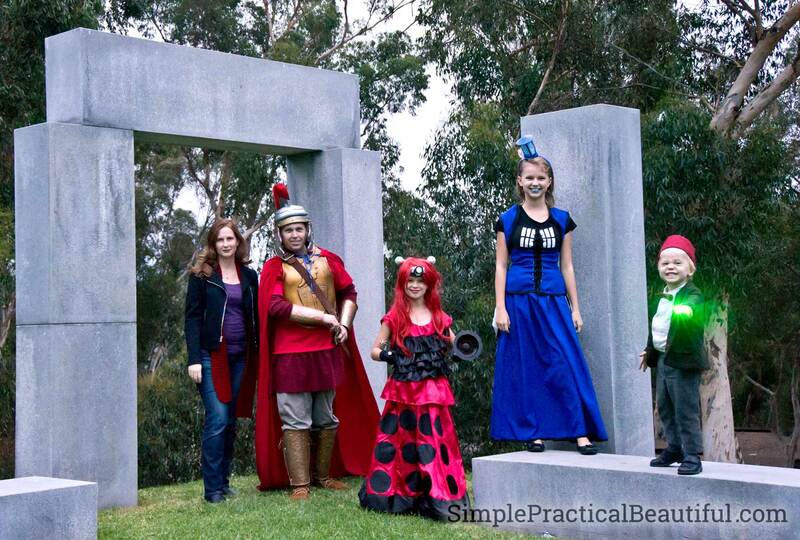 So for Halloween, our family voted and decided on Doctor Who as a family costume. 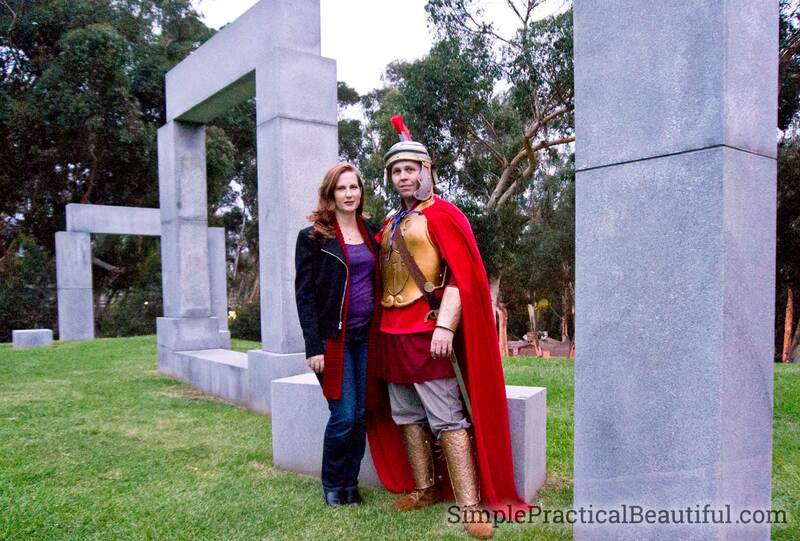 Because costumes and characters change somewhat in different episodes, we decided to base our costumes on the Doctor Who episode “The Pandorica Opens” where the Doctor and Amy go to Stonehenge during Roman times and find Rory is a centurion then are attacked by every evil alien in the universe. It’s a really good episode, but I think we chose it because my husband got to make some cool armor for his costume out of foam. My little boy was the 11th Doctor, who was played by Matt Smith. For his costume, we used his gray church suit that was starting to get a little small and dyed the jacket brown. I sewed red elastic onto the pants to be suspenders and we happened to have a cool red bow tie. I also wanted to sew patches on the elbows but ran out of time. If you need to buy a suit for a small boy, look during the summer when it’s wedding season. They are hard to find the rest of the year. 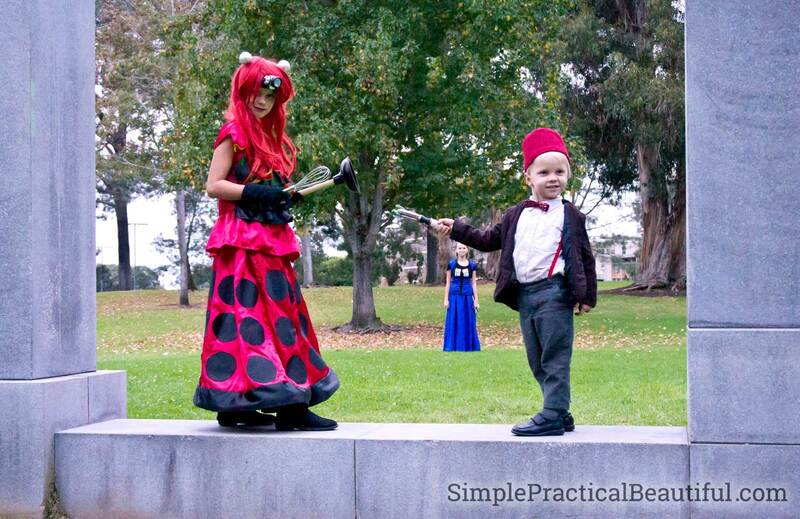 The Doctor also has a fez made of red felt (because fezes are cool) and his sonic screwdriver, or “magic screwdriver” as my son liked to call it. 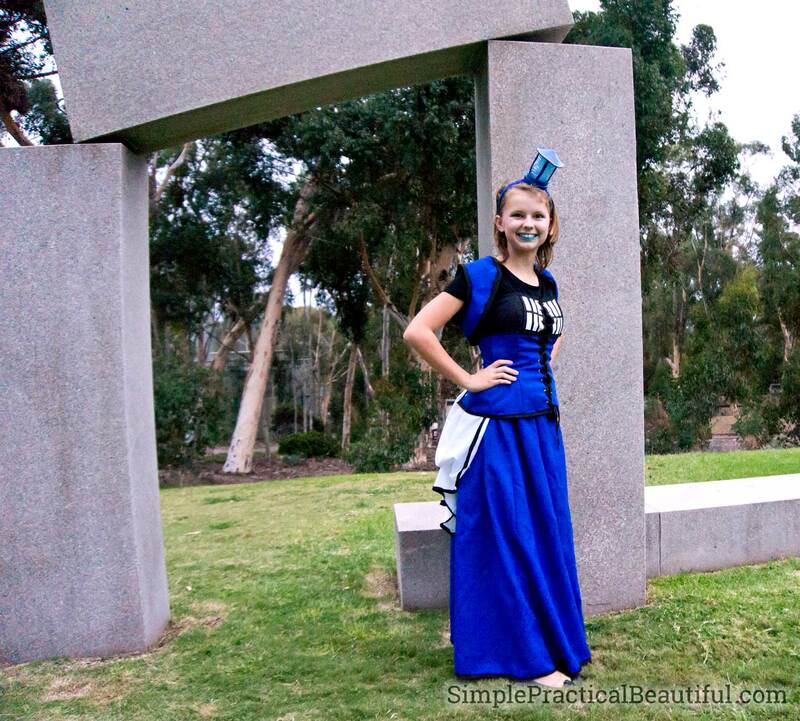 My daughter was a steampunk-esque version of the Tardis with a corset and bustle made following Simplicity pattern 1095. She made the pattern with only a few alterations. She also wore a light made of foam on a headband that glowed like the light on top of the Tardis, and she carried her iPod around playing the sound the Tardis makes when it travels. My younger daughter also used Simplicity pattern 1095 to make her Dalek costume; however, we made a lot of changes from the original pattern to make it look more like a Dalek from the show. She didn’t wear a corset at all but instead made a ruffled shirt that looked like the accordion black rubber on the Dalek. 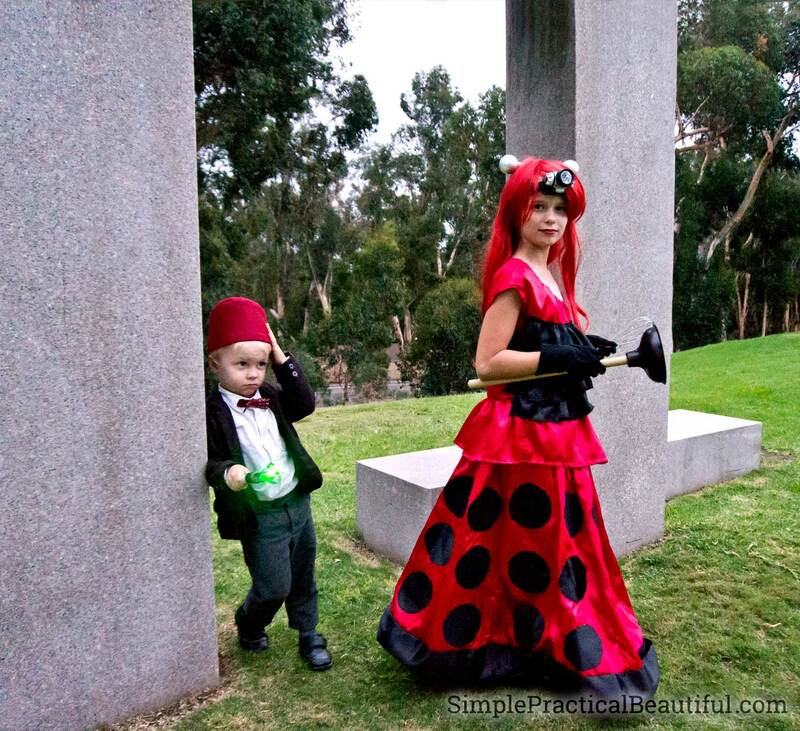 She also wore a headlamp under her red wig and added two Christmas ornament balls to look like the transmitters on top of the Dalek’s head. My husband’s costume was definitely the most intense one in our family this year. 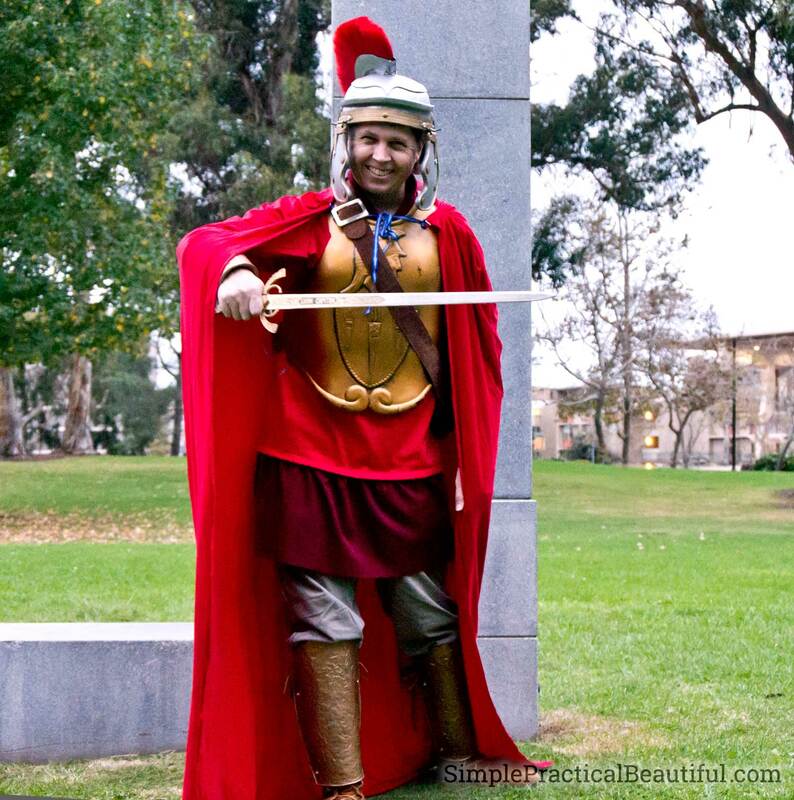 He was The Last Centurion and he made his costume very accurate to the episode. He created a centurion helmet, arm bracers, and shin guards mostly out of foam. He also made a tunic and leather (okay, pleather) jerkin plus a long red cape. There’s probably more accurate names for the parts of his armor, but you get the idea. It was awesome. Sadly, most people who saw us dressed in our costumes asked me why I didn’t dress up. I guess the reference was too obscure if you’re not a Doctor Who nerd fan. Amy wears everyday clothes, but I tried to match her outfit exactly. I wore a purple shirt with jeans and boots, a black jacket, and a similar necklace. I even knit a red scarf to match the one Amy wore in this episode. One of my favorite parts of Halloween is taking family photos. Halloween night is dark and so are most Halloween parties, so the details of our costume are often lost. But photos capture it all and preserve our costumes. That’s important when you spend as much time as we do making them. Finding the perfect background for Doctor Who was challenging. San Diego just doesn’t look much like England, especially medieval England. Fortunately, we found that UCSD has a sculpture that looks a whole lot like Stonehenge. It’s even on green grass. I have several more posts to write about our costumes, so I can tell you all the details of how we made our costumes, including the sonic screwdriver, the fez, and all of the centurion armor. I’ll be publishing those posts over the next few weeks, so stay tuned! 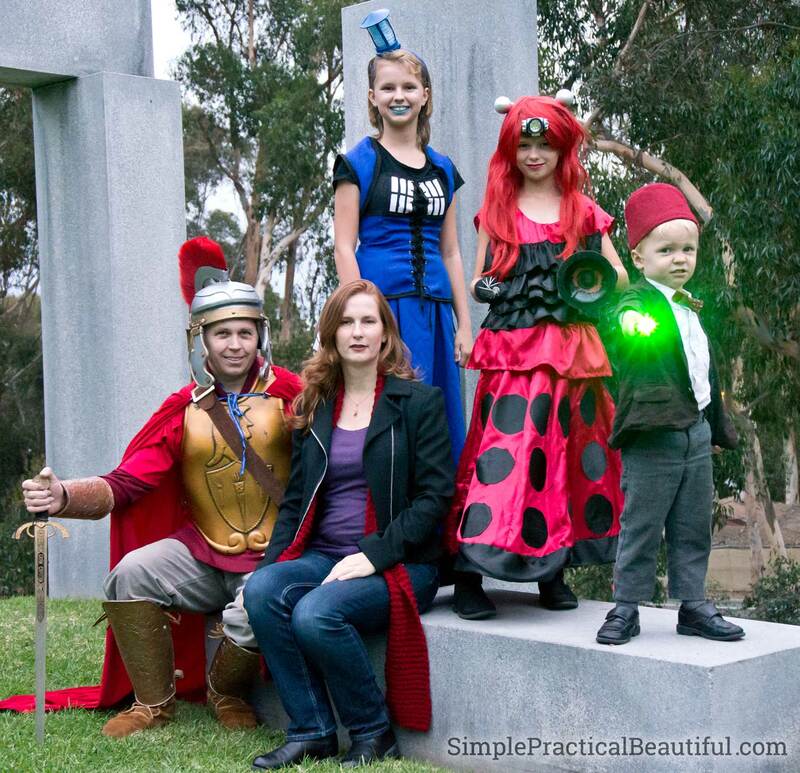 Plus, check out our other family costumes! Halloween is big in our family.